Hi there! Did you have a good weekend? Did you get up to any mischief? I haven't gotten up to mischief in years and even when I did my attempts were pathetic - like filling the coffee, tea and sugar jars with things other that coffee, tea or sugar. Oooh yes, beware of that one! I was playing the part of the matchmaker this weekend. Not the fun matchmaking type i.e. setting up friends on a date, but moving bits and pieces around my home trying to work out what looks best together. Now don't get me wrong, I don't usually like to match things as such but when I laid out these items I purchased recently for the master bedroom I was surprised to see how well they matched together. Maybe I'm just on a yellow and blue kick at the moment. Does anyone else find they go through periods of buying things in similar colours? 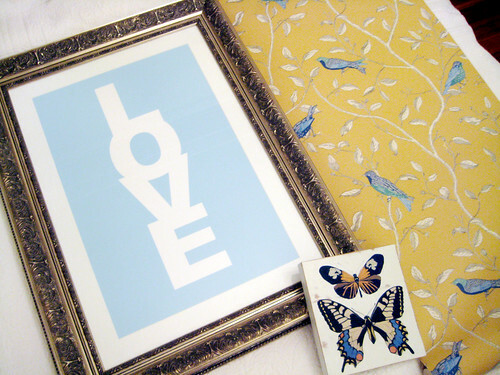 LOVE Candy Print by MadeByGirl - Love love love this!! 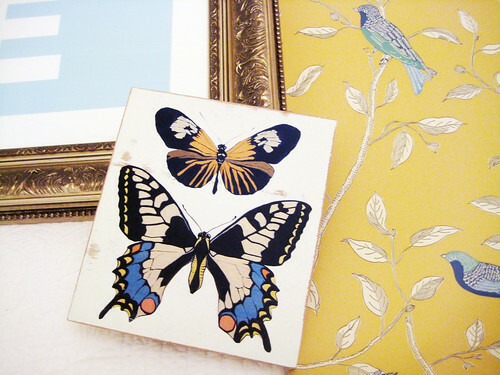 Butterfly art from Bed Bath N' Table - Bought on sale! Sanderson wallpaper from decorsupplies - I can't get enough of this design. A framed piece of this paper might look good in the bedroom.